Big bluestem (Andropogon gerardi) was the most important species for wild hay production in tallgrass prairie regions due to its productivity and quality. However, it is very difficult to find wild big bluestem since natural tallgrass prairies have been converted to annual crop production. 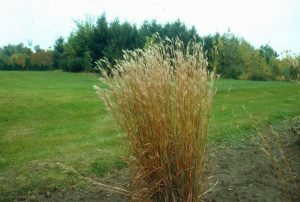 Along with Indiangrass, big bluestem has been frequently used for soil and water conservation work.